This year Florida Philanthropic Network is losing a valued member. The Eckerd Family Foundation is sunsetting, per the intentions of the foundation’s founders, the late Ruth and Jack Eckerd, and therefore will no longer be a part of our membership. 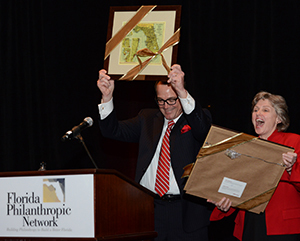 On February 1 at FPN’s 2013 Statewide Summit on Philanthropy, we honored two of the Eckerd Family Foundation’s leaders, Joe Clark, the foundation’s president, and Jane Soltis, the foundation’s vice president. 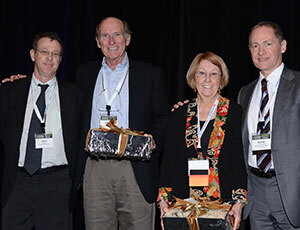 At its 2013 Statewide Summit on Philanthropy, FPN honored Joe Clark (second from left) and Jane Soltis (second from right) of the Eckerd Family Foundation for 15 years of philanthropic leadership. Honoring them were Jake Short from the Eckerd family’s next generation (l.) and David Biemesderfer, FPN President & CEO (r.). The theme of Florida Philanthropic Network’s 2013 Statewide Summit on Philanthropy was “What Is Philanthropy’s Leadership Opportunity?” So it was a particularly appropriate occasion for FPN to honor two people who have taken full advantage of their leadership opportunities in Florida’s philanthropic sector: Sherry Magill, President of the Jessie Ball duPont Fund in Jacksonville, and David Odahowski, President & CEO of the Edyth Bush Charitable Foundation in Winter Park. Sherry and David are two of the co-founders of Florida Philanthropic Network. They have served on FPN’s Board of Directors since FPN’s first Board meeting in 2001, and they left the Board on January 30, 2013, after more than 12 years of service. Joining me in honoring them at the Summit was Steve Marcus, President & CEO of the Health Foundation of South Florida, who co-founded FPN along with David and Sherry. David Odahowski and Sherry Magill react to a standing ovation while being honored at FPN’s 2013 Statewide Summit on Philanthropy.